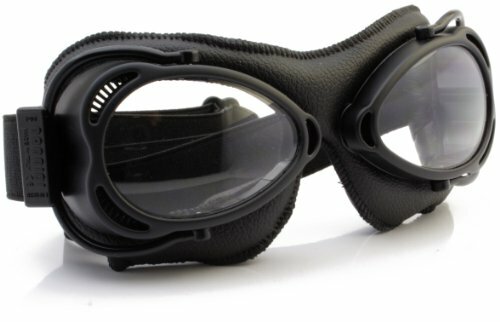 The newest model of motorcycle goggles created to be used over the helmet, It has the adjustable fork and the elastic band mounted on. Pocket foldable to fit conveniently in your pocket. The Venturi (air intake) is positioned to obtain the maximum ventilation. Fork joint permits the goggles to be worn above the helmet without compromising face contact. The cylindrical scratch-proof polycarbonate lightweight lens, provide best comfort without distortion. The frame is durable Composite-Plastic frame for maximum protection, comfort and stress resistance. The water-resistant leather padding provides for superior wind and water protection. It has chrome / black color features. The lenses offer 100 percent UV protection. Prescription lens inserts is available (sold separately). It also provides soft carrying pouch. If you have any questions about this product by Nannini, contact us by completing and submitting the form below. If you are looking for a specif part number, please include it with your message.